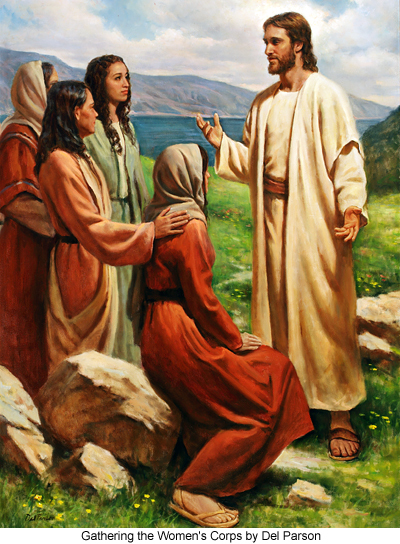 150:1.1 Of all the daring things which Jesus did in connection with his earth career, the most amazing was his sudden announcement on the evening of January 16: "On the morrow we will set apart ten women for the ministering work of the kingdom." At the beginning of the two weeks' period during which the apostles and the evangelists were to be absent from Bethsaida on their furlough, Jesus requested David to summon his parents back to their home and to dispatch messengers calling to Bethsaida ten devout women who had served in the administration of the former encampment and the tented infirmary. These women had all listened to the instruction given the young evangelists, but it had never occurred to either themselves or their teachers that Jesus would dare to commission women to teach the gospel of the kingdom and minister to the sick. These ten women selected and commissioned by Jesus were: Susanna, the daughter of the former chazan of the Nazareth synagogue; Joanna, the wife of Chuza, the steward of Herod Antipas; Elizabeth, the daughter of a wealthy Jew of Tiberias and Sepphoris; Martha, the elder sister of Andrew and Peter; Rachel, the sister-in-law of Jude, the Master's brother in the flesh; Nasanta, the daughter of Elman, the Syrian physician; Milcha, a cousin of the Apostle Thomas; Ruth, the eldest daughter of Matthew Levi; Celta, the daughter of a Roman centurion; and Agaman, a widow of Damascus. Subsequently, Jesus added two other women to this group — Mary Magdalene and Rebecca, the daughter of Joseph of Arimathea. Luke 8:1-3 Soon afterward he went on through cities and villages, preaching and bringing the good news of the kingdom of God. And the twelve were with him, and also some women who had been healed of evil spirits and infirmities: Mary, called Mag'dalene, from whom seven demons had gone out, and Joan'na, the wife of Chuza, Herod's steward, and Susanna, and many others, who provided for them out of their means.